From its beginnings in the 1960’s as a plumbing and heating company, diversification has helped this New Brunswick-based business — not only survive, but grow into a bustling industrial company with a team of nearly 400 dedicated employees. Among their recent achievements: the fabrication and installation of pipe at the first LNG Plant in North America ... not to mention a major refurbishment project at the Point Lepreau nuclear generating station. 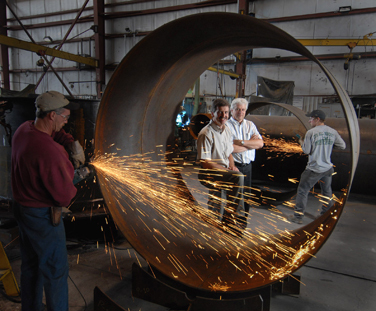 “Today, we handle all kinds of construction projects — from energy plants to oil and gas installations — with a variety of fabrication and industrial supply services as well,” says company President Gordie Lavoie. In fact, he says they’ve taken their expertise in implementing ISO 9001:2008 standards across the region and into the U.S. and are now ready to go even farther in their expansion sights. As Far As The Middle East. “When we’ve ventured out of our region, we’ve traditionally looked to the U.S. market for new sales ... but we soon realized that we have enough oil and gas expertise to potentially enter the Middle East market,” Gordie says. Over the years, he says Sunny Corner has benefited from ACOA assistance at some critical points in their history, allowing them to expand their markets, establish important business partnerships, and build their fabrication shops. These days, assistance under ACOA’s Business Development Program is helping them secure manufacturing equipment to enhance their fabrication division. Already, the company has made progress on reaching their Middle-Eastern goals. It is also garnering international attention by partnering with other like-minded businesses to bid on large contracts and by realizing smaller projects, like the ductwork they recently fabricated for installation in a generating station in the United Arab Emirates. Now that’s a business with fuel for expansion.